Shinobi-syodzoku is the specific camouflage cover that is the part of Ninja uniform to wear by traditional warriors of the shade. Uwagi aka dogi is a jacket that reminds the style and design of traditional Japanese kimono. Uwagi is a little bit shorter than kimono with slices from behind and by sides. The jacket had a plenty of secret pockets. Uwagi sleeves are loose used as pockets, either. When climbing the tree or narrow holes, the Ninja used to fold and tie the sleeves with special laces. Tekko or temaki are handmade puttees made from the whole trapezia-shaped cloth with loops for hooks. Sometimes tekko was made to style the Japanese brigantine with metal rings sewed on the outer side of the fabric. Hakama from Iga or iga-bakama are pants popular among the most peasants from the suburbs of Iga and Koga. The pants were designed loose tapering to legs, with the belt band and a slightly high back part. A jacket is done in pants. An additional protection device was used to wear onto the shank called foot puttees ((ashiaki) or (kyahan)), with pockets to secretly bear smaller kinds of weapon. Dodzime or shinobi-obi – Ninja belt of 2.5-3 meters long, a little bit wider than conventional ones. Sometime back the artisans would manufacture belts with the chain sewed in from inside and therefore such belts were effectively used as one of the most dangerous weapons. Such belts were impossible to cut off. Shinobi-tabi are Ninja socks. Unlike other socks the Shinobi-tabi had the sole made from leather not cotton to achieve higher quietness. They have no clasps from the rear side which are worn as surgical boots and tied. Such socks ensure soundless motion and perfect adhesion with the surface of the wall or a tree a Ninja climbs. Fukumen is a mask. There are two kinds of masks, having two cloths of fabric (one cloth is smaller than another) or a single one long cloth of 25cm wide and 2m long. Warriors of shadow also used a hood cap called dzukin. Nagabukuro is a personal bag to carry espionage belongings. The bag is tube-shaped and designed to carry as a rucksack. Kusari-katabira is a suit of armour. As a rule, the warrior would use armor suits as the plain model. Kusari-katabira was made of a shirt, armlets, greave and heaume used as a mask or a hood to protect the head and neck and lower part of the face. Ninja used to wear Kusari-katabira under the camouflage suit not to make noise which is crucially essential for Ninja. It is assumed that Ninja prefer black color clothes to stay invisible, though it is not that right. The black color is strongly distinguished in the night. 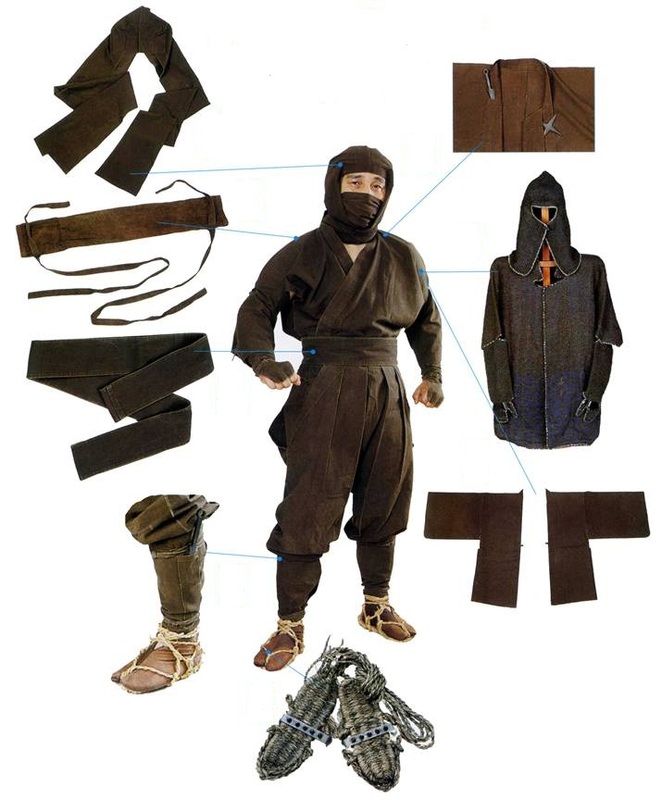 The Ninja uniform was rather of lurid color or brown. There was not a specific standard for Ninja to follow in regards to the outfit. For winter season the Ninja uniform was white or dingy white. For other season the Ninja used to wore grey, lurid or dark brown Shinobi-syodzoku using the paint most suitable to the region where Ninja was about to fight. Sometimes Ninja used a two-colour uniform, painted in dark from external side and white- from inside. The reason of changing colors and suits lies in the Ninja strategy and tactic to stay invisible, merge with the environment to become its part, but not distinguish.